White Egret Orchid accent planting… thanks Wolfie. Wolfie turned me on to this amazing Orchid accent planting, I purchased 6 tubers off eBay for £18.00! They are VERY EXPENSIVE… the benefit is that the double every year so long as you maintain them well. They are said to be hardy down to -6C (20F). They should be planted in humus-rich soil, in a cool house or greenhouse. I have kept mine in my greenhouse up to last week and have just brought them into the house because the winter in the North of England is arriving thick and fast. A legend has it that during a period of conflict, a girl from the Castle of Setagaya (Tokyo) sent a letter to help her lover who was fighting in a battle. She gave it to a white Egret to deliver it to him. However, the Egret did not reach him and, where the bird fell to the ground, a beautiful flower began to grow. 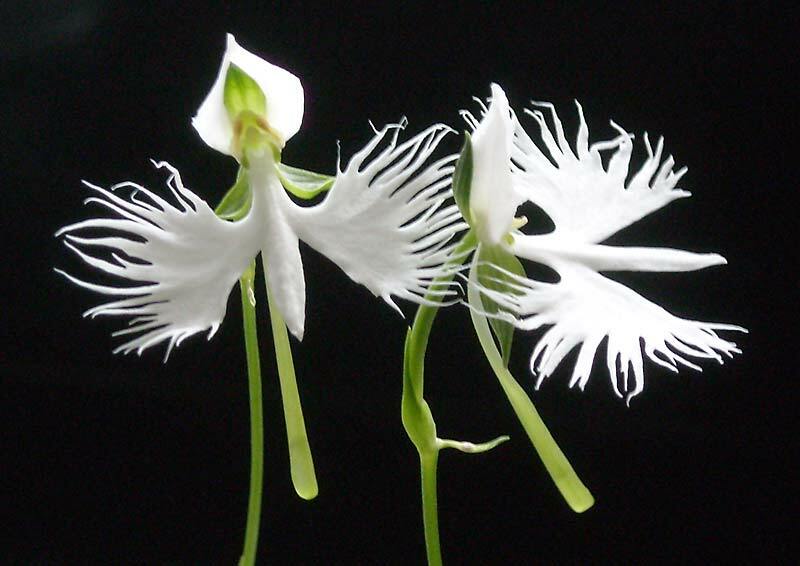 This flower was the White Egret Orchid (Habenaria radiata), known as Sagisoo to the Japanese people, and now the flower mascot of the Castle of Setagaya. 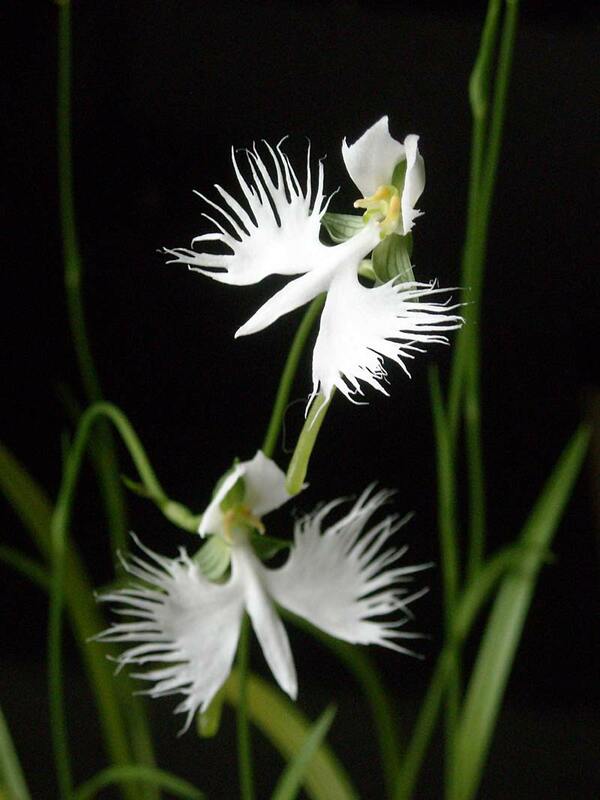 Re: White Egret Orchid accent planting… thanks Wolfie. I also tried them 3 times, this year the last ones died on me. But in Februari I order some new ones, I found a adres for the vargiatet leaves cultivar. Great pictures of a great plant. I have seen the varigated variety on-line but I haven't found a source for them here in the US. I'm probably going to give them another try....I can't resist! Would you happen to know a source for the varigated variety that ships in the US? Unfortunally not, they only ship inside the E.U. Hi Tony. £18.00 for 6 tubers... Expensive!?!? Me thinks you find a bargain. I have 15 or so native terrestrial Orchids and the most Ive paid is £30 for one!! W hen I got it, I opened the box and found what appeared to be a small pile of noodles. It is the Lady Slipper Orchid though. Ive found that all the ground based Orchids thrive on neglect. The tiniest ammount of feed and dont over water or you'll never see them again. Ill try and find a photo. The Wild Orchid Company, in Carversville, PA , USA caries the White Egret. It says order in September for delivery in Spring. I think I'm going to try them. THey also carry a basic orchid handbook. There are a couple of Orchid growers I've used in the past. both on the web and mail order. Now is the time to order. Hardy Orchids in England and Crustacare in Belgium. 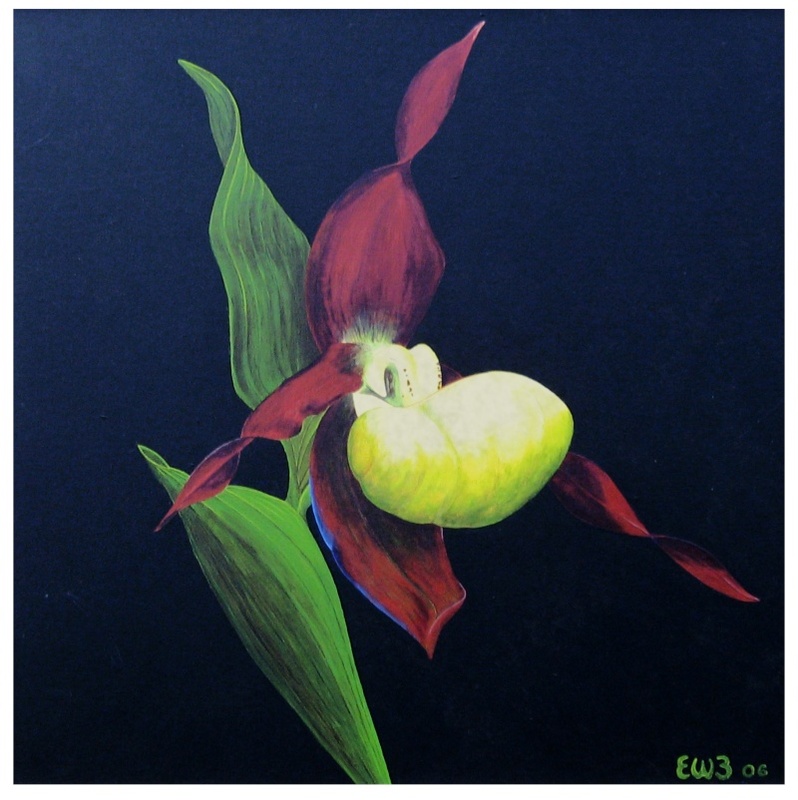 Could'nt find the photo but heres paintinng to show the flower. Plant is about six to eight inches tall. will baddeley wrote: Hi Tony. £18.00 for 6 tubers... Expensive!?!? Me thinks you find a bargain. When these babies arrived in an envelope they were like shriveled baked beans, I planted in chopped (fresh) Sphagnum Moss and bark chips... in a shohin bonsai pot and this is where they will remain after flowering... is it OK to overwinter still in the soil but protected from frost or will they rot? Sorry to upset the apple cart guys, but 3 of these were being given away with every order over £8 in the seed catalogue my wife gets every year. And before you ask, no we haven't still got it. And yes, I'll ask her which company it was. Harleyrider wrote: but 3 of these were being given away with every order over £8 in the seed catalogue my wife gets every year. Steve check the details "shriveled baked beans"
Nope, definately the same as these. I remember 'cos I had to stop her ordering £8 of stuff we didn't need just to get the orchids. ......is it OK to overwinter still in the soil but protected from frost or will they rot? Yes. I overwinter them in their pots along with my trees at 30-35 degrees F. They have always sprouted back. iasnore wrote: ......is it OK to overwinter still in the soil but protected from frost or will they rot? great thanks 30-35 F... now whats that in C ? 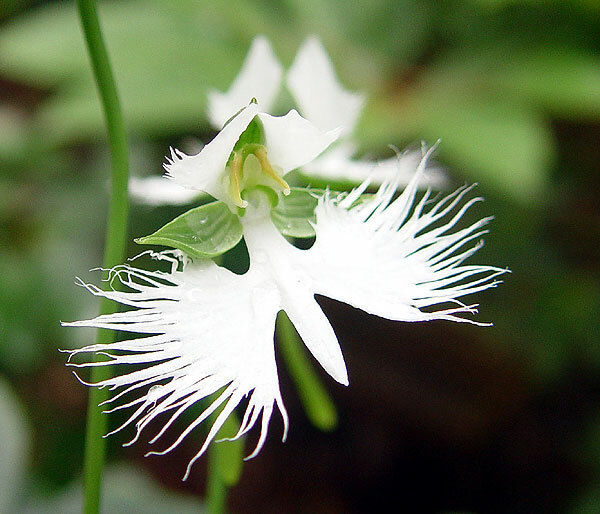 Great pics...I love the Egret Flower, and have bought from Wild Orchid Company in the past. Interesting story to go with it Tony. I used to use o pic of one for my avatar! The C stands for Confusing! I had to look it up, I'd freeze to death standing outside trying to figure it out in my head! Think that's bad, it took me two days to figure out the "the North of England" was in England. According to the map, if you drive North of England you run into SCOTLAND! Jay Gaydosh wrote: Think that's bad, it took me two days to figure out the "the North of England" was in England. If you run into Scotland proclaiming it to be the North of England, you will have to be prepared to run back out again. Very fast! Very fast indeed! Yupp, I looked at the map of England and just North of England is Scotland. Now, when I get to Scotland, I would not imply that Scotland was The North of England. Being of Scottish descent myself, I would declare England to be The South of Scotland! Come on Lass, I thnk we can take them! Jay. I'd never have guessed you were of Scotish decent!!. Is it true that if a woman wears a kilt, she's a cross dresser??? will baddeley wrote: Jay. I'd never have guessed you were of Scotish decent!!. Is it true that if a woman wears a kilt, she's a cross dresser??? Yupp! (Although there are two general exceptions, when a woman is dressed for Scottish dancing and the kilt is the appropriate costume for the dance and when the woman is a piper or drummer in a bagpipe band. Fiona might be able to fill us in on any other times where a woman in kilt would be appropriate. As for looking Scottish, I'll leave that to better judges than myself. A funny story, a few years back at our Highland Games & Celtic Festival we had an association rent vendor space to sell funky little Scottish bears. At first glance (and from a wee distance) they all looked to be well dressed lasses all in full kilt. Then, like an Iraqi scud missile (looks dangerous from a distance but can't hit shite), as you got closer, you suddenly became aware that they were all men, dressed as women, dressed in full kilt. They were cross dressing, cross dresers! HA! Unfortunately, we decided to not invite them back after one of them was arrested for pulling a skign dubh on a patron of our games because they wouldn't get out of the way so that the CD-CD (crossdressing crossdressers) could get through to their booth. Too Funny! I move we get back to white egret flowers before I feel the need to pull a sgian dubh on myself!